JAPANESE exchange students caught a glimpse of Australian culture when King’s College Warrnambool treated them to a sheep shearing demonstration last week. 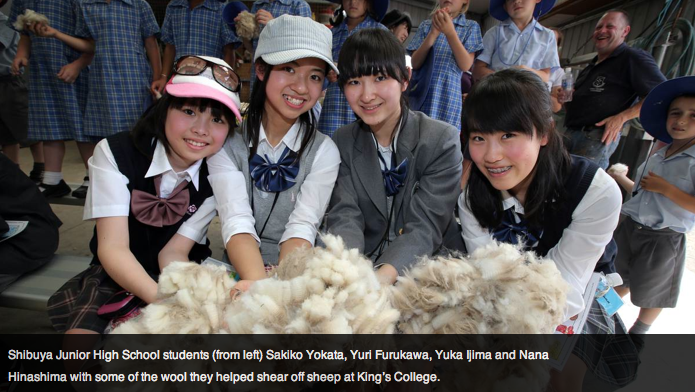 Each of the 14 students from Shibuya Junior High School, Tokyo, tried their hand at shearing. The afternoon was part of their 12-day homestay program in Warrnambool, where the students learn about Australian culture and improve their English language skills. King’s College’s Japanese homestay program co-ordinator Les Gardiner said the international students had a wonderful afternoon. “It’s a bit of Australian culture for them. It’s a fun experience that they would never get in Japan,” he said. The Japanese students also showed their King’s College counterparts some Japanese games, origami and calligraphy. Mr Gardiner said 11 Victorian schools were hosting a total of 300 Japanese students but King’s College was the only school that had a sheep shearing demonstration. “We don’t have anything like this at our school in Tokyo. The school only has a building and there is no schoolground or open space,” Shibuya Junior High School English teacher Ruiko Nagai said. The program has been running since 2006, with past students still keeping in touch with their Australian host families. The 15-year-old students arrived in Warrnambool on Wednesday and will leave on March 18 after visiting local attractions including Tower Hill, Flagstaff Hill and the Great Ocean Road.